Chances are you’ve seen Auschwitz-Birkenau. Perhaps you’ve also toured one or more of the museums at Majdanek, Sobibor, Treblinka, Belzec, Bergen-Belsen, Buchenwald, Mauthausen, and Terezin, hauntingly familiar names. But what about Ukhta, Iskitim, Karaganda, and Kolyma? Probably not. And although Soviet travel restrictions collapsed with the country, it’s too late. Soviet labor camps never made any landmarks commission. Even ruins are scarce. In researching her fluent book on the Gulag (the Soviet prison-labor system) Anne Applebaum crisscrossed Eurasia—and found the old brick punishment block from camp No. 7 of Ukhtpechlag that an Armenian car mechanic was using as a workshop. She also discovered a few memorials, in the outskirts of Petrozavodsk (Karelia), Tomsk (Siberia), and Kiev (Ukraine); crosses at the Vorkuta (Arctic Circle) coal mines; a modest exhibition room at Solovki (Russia’s far Northwest); and a commemorative chapel in Syktyvkar (Komi). Only Perm-36 proved to have a full-scale Gulag museum in the barracks of an actual camp, which local historians rebuilt, establishing camp-reminiscent logging operations to defray reconstruction costs. No national Gulag museum exists. And yet the Gulag is everywhere. Some camps were incorporated into newer and still functioning industrial-production prisons, especially in Western Siberia, the densest part of Russia’s regular prison system today. (Hard to get a peek unless you get arrested.) The dank cells of a prison at the former Dalstroi camps, headquartered in remote Magadan, house the archives of the gold trust’s accounting department—at least, they did as of 1993: crumbling, moldy copies of reports to Moscow, phony statistics that turned up on Stalin’s desk. In plain view, too, a continent’s worth of monuments to slavery survive. The main building of the Soviet Union’s, and now Russia’s, most prestigious university, Moscow State, is a wedding cake to forced labor. Ditto many airports, railroads, dams, and other infrastructure also built by the Gulag penal system and inherited by the 15 former Soviet republics. A sizable share of the property now owned by Russia’s filthy rich gas monopoly, Gazprom, was bequeathed by the Gulag. And don’t forget the nickel mines, diamond collieries, copper pits, and many oil fields that deliver phenomenal revenues for today’s private owners comprising Russia’s or Kazakhstan’s Fortune 500. They were founded by involuntary pioneers, buried in unmarked graves. 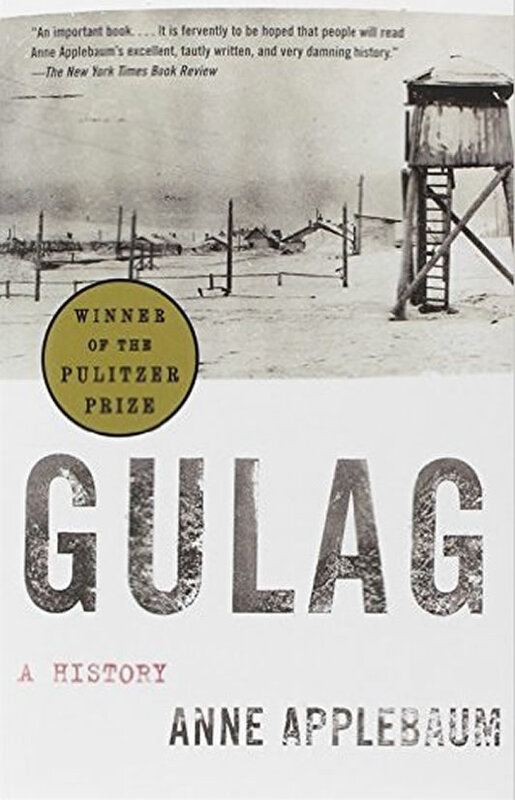 Applebaum, author of the prize-winning travelogue Between East and West (1994), could have written a spectacular guide to the Gulag in the present, probing moral ambiguity. She has written an encyclopedic synthesis of the Gulag’s past, advocating moral clarity. Evoking the Nazis, Applebaum calls the Gulag sites “concentration camps” even as she effectively details the Soviet obsession with captive, albeit unproductive labor for their economy. At any given time, the Gulag held 2.5 million or so people, but turnover was fantastic, given the many short sentences and releases. Once-secret reports record 18 million convicts passing through the camps between 1929 and 1953. Another 6 million were deported or exiled to far-flung work sites, and at least 4 million more POWs were enslaved—for an estimated 28 million “zeks” during Stalin’s time. Between one-quarter and one-third were “politicals”—that is, fabricated “counter-revolutionaries,” innocents. The overwhelming majority consisted of “criminals,” a category that included unfortunates who were a few minutes late to work or engaged in survivalist “speculation” as well as thieves, rapists, and murderers. The latter, infamously, ruled the camps, until genuine politicals—Baltic and West Ukrainian integral nationalists—got swept up into the Gulag in the 1940s and organized mass revolts, forcing regime concessions and auguring the onset of the end. An idiot academic obligingly always turns up to minimize or rationalize the horrific crimes, but, as Applebaum writes, the Gulag story suffers principally from indifference. How many people read even Alexander Solzhenitsyn’s three-volume best seller The Gulag Archipelago, 1918-1956 (1974-78), unsurpassable in its score-settling panache and psychological depth? Applebaum’s comprehensive account marshals the secret data Solzhenitsyn lacked from the now declassified Gulag central archives in Moscow (available also in sunny California’s Hoover Institution, like a Cold War victory trophy). After 2,000 endnotes referencing documents, memoirs, interviews, and profuse scholarly studies in Russian, Polish, French, and English, she delivers readers essentially to where the anti-Soviet master’s “literary investigation” did, despite gingerly criticisms of him: Lenin, not Stalin, founded the camps; they were integral to the Soviet system; they were evil. Still, it took cheek to tread where the former zek Solzhenitsyn left such bigfoot imprints. Samizdat poem to camp “goners,” set in what today is a recreational destination in Russia’s Magadan province (translated by Anne Applebaum and Galya Vinogradova). But are forced to drag on. To the scurvy which sticks to their teeth.